"Sure, you can rent the puppy if you want. Just make sure it's healthy when you bring it back." 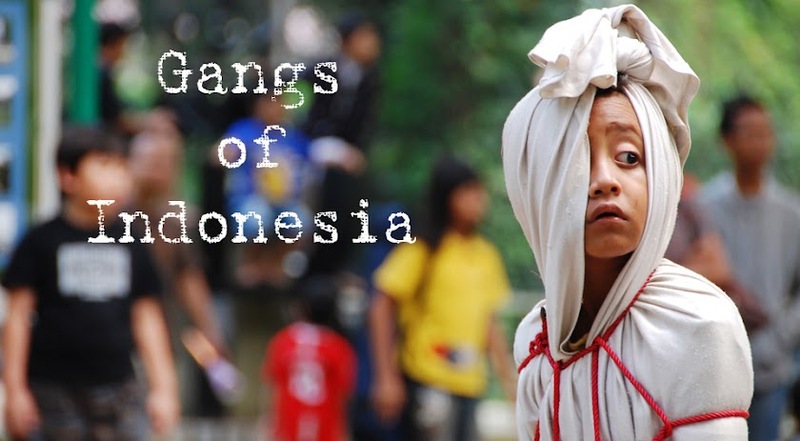 This post is sheer indulgence: marking the first anniversary of Gangs of Indonesia! Sixty-seven posts later, we're back to where it pretty much all started - at the puppy market in Menteng, Jakarta. 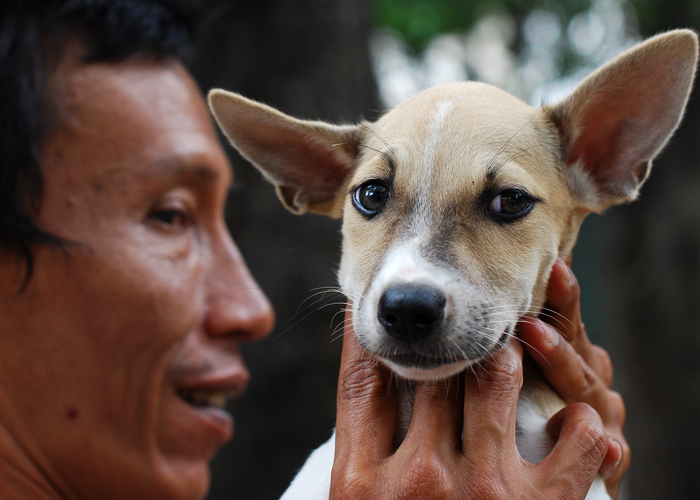 Haryanto, above, originally from Surabaya in East Java, has been selling puppies in Jakarta for the last seven years. 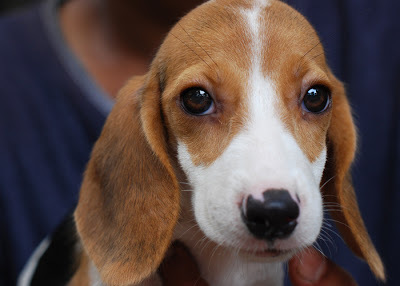 "You can order any breed you like, we have them all," he says, referring to the dog farms in Bogor and Bandung. "But you can rent puppies too." 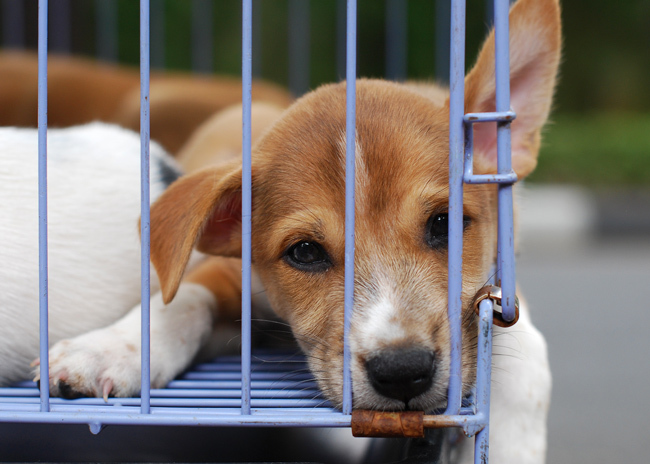 "Why would anyone want to rent a puppy instead of buying it?" "Some people are on short contracts here. And others rent dogs when they go shooting. I recently rented a puppy to an Indian man." "How long did he rent it for?" "Has he brought it back?" "Yes, and I've sold it on." "How much does it cost to rent a puppy?" "How do you know customers will bring the puppies back?" "They promise me. And we sign a letter." "If people rent puppies and bring them back when they are older, do you have trouble selling the dogs on?" "No, some customers want young puppies for their children to play with, and others want older dogs to guard their houses." Haryanto shows long teeth and blue gums in his smile: "I have an 8-month old German Shepherd called Bruno. Do you want to come back to my house to see him?" "What do you feed the puppies?" "Do they also eat sambel?" This makes the sellers laugh. (Sambel is chilli sauce, the Indonesian favourite after rice). "No, we don't give them sambel, but we do feed them chicken feet with the rice." My Indonesian friend here in the Netherlands has to carry a pot of Sambal around with her which she adds to every single thing she orders from a restaurant or eats at a friend's house! She has a dog - perhaps she gives it to him too LOL! You know the way straight to my heart strings. How can anyone take one of these adorable doggies home for only 2 weeks? I could not imagine giving it back!! I need to get you here Mel so you can do a photo shoot of Houdini... And bring one of these pups with you! nice info sis, honestly i just known this information by reading ur blog. my wife loves dog but we can't have them in house, so this is a good solution for us, renting a dog for strolling around jakarta for a day or two. Hi Otong Marutong, watch out the dog doesn't steal your heart, making it impossible to return...!